The Birth Certificate is a forgery! Obama Conspiracy Theories forensic document analyst Dr. Conspiracy [not a real doctor or a real document analyst] has ruled the John McCain “birth certificate” submitted as evidence in the Hollander v. McCain lawsuit a forgery. For those who know this web site well, let me assure you that this is a serious article from now on, and not a joke, spoof or satire. The question of where John McCain was born did not carry much interest in the last election; however Fred Hollander brought a lawsuit (dismissed for lack of standing) asserting that John McCain was not eligible to be president because he was not born in the United States. Conventional wisdom (and newspaper articles including Citizen McCain – Washington Post) assert that McCain was born on a US Military Base in the Panama Canal Zone. While some have argued that this is insufficient to make McCain a natural born citizen, Fred Hollander went one step further, claiming that John McCain was born not in the Panama Canal Zone, but rather in the Republic of Panama itself (and not under any US jurisdiction whatever). 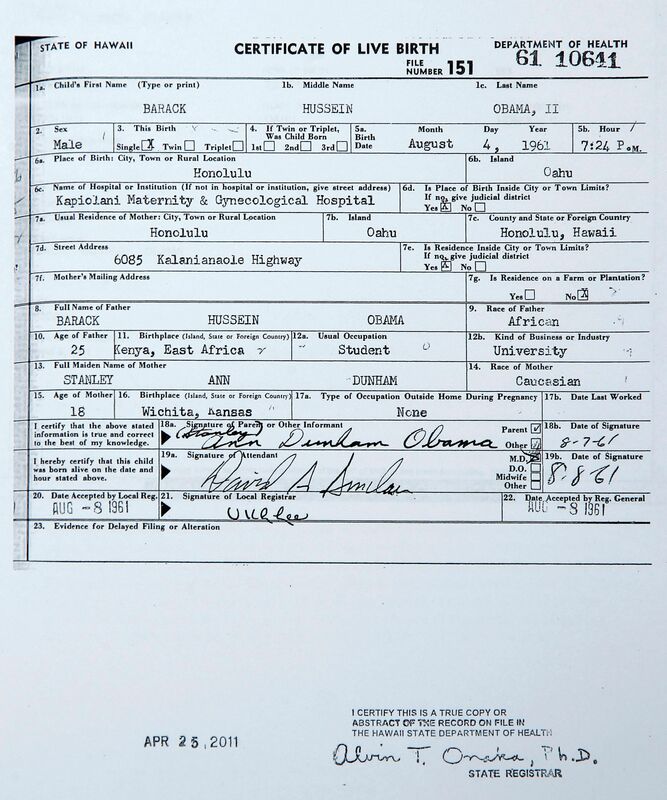 After the birth certificate image (shown above) appeared on the Internet some individuals became convinced that this was absolute proof that John McCain was born in the Republic of Panama and went about jumping on any web site that said otherwise. I myself went back and forth on the issue, but I am convinced now that the Republic of Panama birth certificate is a fake. As a base line, let’s look at the image from Hollander v. McCain. 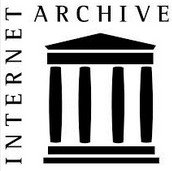 The link provided directs to the Ohio State University archive of Hollander v. McCain documents. I have a higher resolution image (click on the picture above) that I will be using for exhibits following; however, the items I will point out are visible on the Ohio State University court document archive too. Thesis: the birth certificate is a real Republic of Panama birth certificate issued in the month of August to someone born at the hospital in Colon, but on a different date and to different parents. Exhibit 1 shows a magnified section of the birth certificate detailing the time of birth. Pay particular attention to the number “6” and how the top of the number appears. We will consider this accurate and authentic (there’s no reason to fake the time of birth). Now compare the number “6” in this image to that in Exhibit 2. Notice the top of the number “6” goes fully across the width of the number. Also note how much clearer the digits are compared to the word “AUGUST” to the left. Because the date of McCain’s birth is known, the day and year had to be altered if this is based on a certificate from another date. Also note the missing underline below “36” where it appears the new number was put in. In Exhibit 3 we see the telltale signs of alteration where the underline is smudged below altered text. This is visible all through the document, for example, under mother and father’s place of birth. Also observe that the letter “I” occupies much less space than the other letters, whereas a real typewriter spaces all letters equally (see, for example, the “i” in “Physician” in Exhibit 5 following). Exhibit 4 is an even better example showing USA’s insertion breaking up the line below. Again we see in Exhibit 5 the clear number “30” for the date registered compared to the surrounding text. Notice of John McCain’s birth on the Coco Solo Military base was printed in a Panamanian newspaper, John McCain showed his real birth certificate to one reporter and McCain’s mother confirmed where he was born. The birth certificate is a fake. I hope noone pursues this. We don’t need the Supremes meddling in yet another presidential election. Look how well the last one turned out. 52 Responses to The Birth Certificate is a forgery! I just want to point out that we don’t know WHAT McCain showed to a reporter, as he didn’t release a copy to the reporter or allow time for detailed inspection. I raise this because of the double standard — McCain allowed one individual to look at a piece of paper in private. Obama posted a copy of his health department issued certificate on the internet for all to see, and allowed at least one organization access to photograph and examine the certificate — and he is accused of “hiding” something. If there is any lesson to be drawn from this, its that Obama disclosed too much. McCain lost. Obama won. McCain is not relevant. Obama is. Ah well, this is not a lawsuit. This is a blog. I can talk about the weather. I can talk about chickens. The real relevance of the McCain fake birth certificate is really not mentioned in the article. You see, when I first got hold of that birth certificate, I was quite skeptical. But then I found it on the Ohio State University web site and learned that it appeared in a lawsuit accompanied by a notarized statement and was submitted by a real lawyer. I was rather awed by the legal ambiance of the thing. I thought in my naivete that fake evidence doesn’t get submitted in high-profile lawsuits like this. I actually came to believe that the certificate was genuine. Other evidence later tipped the balance to “undecided”. But now I know that lies are submitted in high-profile lawsuits, e.g. the Shuhubia affidavit in Berg v. Obama and the McCain birth certificate in Hollander v. McCain, oh and the false information about travel bans to Pakistan and Hawaiian birth certificate law in Kerchner v. Obama. 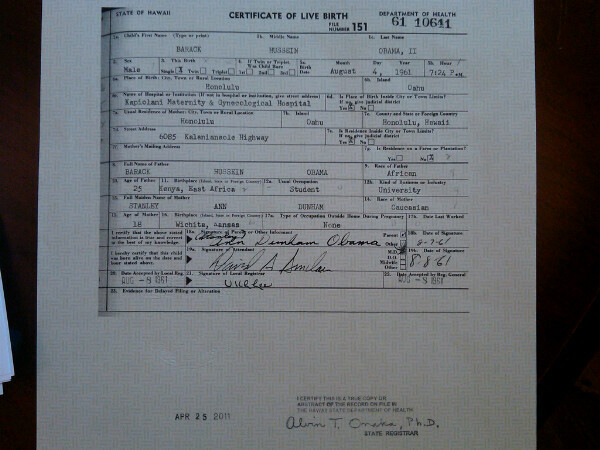 Obama’s father was not a U.S. citizen when Obama was born. No other facts matter, including Obama’s travel to Pakistan, Obama’s Hawaiian birth certificate, or wherever Obama was born. Obama is not and cannot be an Article II “natural born Citizen.” Case closed. Attorney in the Kerchner v. Obama case that you cited. I don’t really want to get into this because McCain is irrelevant. But! I must. I actually have some credentials in this area, so I can offer something of an analysis. First off, you have a PDF. I would not make a definitive analysis from a PDF. PDFs are vector-based, and the process of converting a raster image (such as any scanned document) to a vector image can leave artefacts. I wouldn’t recommend making a definitive analysis on anything other than an original PNG, TIFF, lossless JPEG, or (when appropriate) black and white GIF. We can, however, see some artefacts that are consistent with alteration. First note that the entire document seems to have a double image of the text, at about .3mm (assuming that the whole page including the border is 8.5 in by 11 in). Judging from the pattern, it looks consistent with a document that was photographed and nudged stage left in the process. Next, we get into font issues. The typewritten portion of the document is a monospace font the likes of which I can’t identify. Since Courier and most monospace fonts of today were designed well after 1936, it’s probably not that. JOHN SIDNEY MCCAIN III is not written in a monospace font. I can’t be sure, but it looks like the name here does not exhibit the ghosting that I see in most of the rest of the document. The 29 and 36 definitely do not show such ghosting. John McCain (under FATHER) is again in a proportional font with no ghosting. Same with Roberta Wright (under MOTHER), which seems to have been subjected to gaussian blur. (The other examples I mentioned also appear the same way, but this one appears to be an almost textbook look of gaussian blur. White (under Color for FATHER) also appears to be an alteration. This sort of artefact is the sort of thing that would make any Fark photoshopper say, “This looks shopped. I can tell from some of the pixels and from seeing quite a few shops in my time.” It’s quite clearly cut and pasted from a portion of a document which was darker at that point, and you can see the edge of the box that was used to cut and paste. You can find that under Color for MOTHER. USA under both FATHER and MOTHER appears to be an alteration, since it is lacking in the ghosting of the rest of the image. The Filed date (AUGUST 30 36) appears to be altered, as well. All in all, given nothing but the PDF, I’d say it’s obviously been altered, but I’d have to look at a non-PDF version to say for sure. This doesn’t mean that this was in any way forged. It may be that the company cleans up electronic copies of their documents or that the McCain campaign cleaned it up themselves. It’s also possible that this is not McCain’s birth certificate but rather an altered version created for the specific purpose of making it appear that McCain altered his birth certificate. What else? Ah, yes. In the wake of the Rather memos, I find it hard to believe that the McCain campaign wouldn’t have hired someone who knew enough to not use a proportional typeface on a document written with a non-proportional typeface. Keep dreaming !!! If only pple didnt know before the election that his father wasnt an american, you would have a great case, since pple were aware & still believe he’s eligible & then voted for him, i say you lose !! FWIW, I think the lawyer in the Hollander case was duped — that is, I think the lawyer believed the birth certificate to be genuine. It was supplied by a person named Donald Lamb in Panama with a somewhat shady past. 5) Plaintiff requests permission to file 2nd set of opposition papers, and there attach the the birth certificate.. In the opposition (labeled 4 above),, the defendants made a big deal over the born-on-base part, and by that time rumors were already circulated on the internet alleging the Colon birth place, in part because records showed that the military base hospital was not built until after McCain’s birth. So I’m guessing that the lawyer was presented with documentation that superficially appeared to be genuine with time being short — and elected to run with it. I don’t think it would have come up at all if the McCain lawyers hadn’t made such a big issue in their pleadings about him being born on base — obviously, as the son of 2 American citizens, he would still be a citizen even if born off base — and I think the natural-born issue would still have been resolved for McCain by the congressional resolution that had already been passed. Mr. Apuzzo, you do not have a single court decision you can cite as authority for that statement; you have no way to get standing to bring a lawsuit to raise the issue; and no court in the country has jurisdiction to rule on the eligibility of a sitting President. Andrew, this document did not come from the McCain campaign. It was produced by the plaintiff suing McCain, who either had hired an investigator to go down to Panama or else was scammed by someone claiming to be a Panamanian with access to the records. McCain’s people never released a copy of his birth certificate. 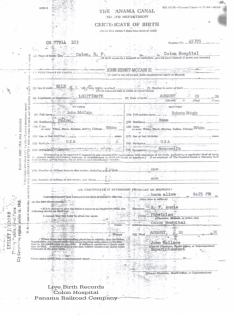 Its possible that they don’t have a good one — there are significant issues about record keeping of births in Panama at the time — the “certificate” shown to privately to the Washington Post reporter could have been one of those hospital-issued certificates that is given to parents, but which is not legally authenticated. Having been born abroad, the more significant documentation with McCain would have been US Consulate records. The plaintiff in the lawsuit against McCain – Hollander — did try to subpoena McCain’s birth records from the Dept. of Homeland Security, but McCain moved to quash the subpoena, and the judge ruled that the subpoena didn’t have to be honored pending the motion to dismiss. Then the case was dismissed for lack of standing, thereby rendering the whole birth certificate dispute moot. I think there is a very real possibility that McCain had something to hide for political reasons. He still would have been a citizen if born off base in nearby Colon, but maybe his lawyers thought he was on stronger ground to argue that he was born on the US-controlled base — although technically that still wouldn’t be US soil. (If a Panamanian gave birth on the US base, her child would not be a citizen). Anyway, we’ll never know because McCain never produced any records and the only documents we do have are questionable. I would add that even though questionable, the documents produced in the Hollander case were accompanied by an affidavit signed by a real person, under oath. That means that a person could have been brought to court to testify as to manner in which the documents were produced or discovered. So while the documents themselves are questionable, the means by which they were presented to the court are quite ordinary. IF the case had proceeded to be determined on the merits, then I think McCain’s team would have produced whatever documents they have supporting his birth, and definitely hired appropriate experts to examine the papers that we are looking at in PDF format. Hey, I’m just calling it like I see it. My point here is that I know nothing about the ulterior source for the document and I am not qualified to comment on the reasons why the document may have been altered. Mr. Apuzzo, of course I recognized your name as the attorney in Kerchner v. Obama. If you don’t want to press your claims of a Hawaiian birth, that’s OK by me; I’m pretty tired of the subject. I will not grant your motion for summary judgment (“Case closed”), but you’re welcome to present your case since everybody, even Ted, has standing at the court of Obama Conspiracy Theories. My view is that the court of public opinion is the only one that will ever hear Kerchner v. Obama. But John Jay was very concerned about foreign influences on future Presidents and Commander in Chiefs. Thus he wrote the letter to General Washington. Washington agreed and had the clause put in the Constitution and the delegates agreed and approved it and the “We the People” of those days voted for it and ratified it. And it can only be changed now by a new amendment by today’s “We the People.” Jay would have obtained the term “natural born Citizen” from the leading legal treatise of those times, The Law of Nations (1758), E. Vattel, Book 1, Chapter 19, Section 212. 1. There is no evidence of how the phrase “natural born citizen” was added to the first draft of the Constitution. The record of debate is totally silent on this subject. We do not know that Washington had the clause added. We do not know that it was debated. It could even have been added by the Committee of Style after the debate. We just don’t know. Jay’s suggestion via Washington is plausible, but not certain. You would be hard pressed to demonstrate that more than a tiny fraction of Americans ratifying the Constitution had ever heard of de Vattel. 2. You said “future Presidents and Commander in Chiefs” but the Jay letter only refers to Commander in Chief. At that time the two offices were not necessarily tied together. 3. You said “Jay would have obtained the term “natural born Citizen” from the leading legal treatise of those times, The Law of Nations (1758), but Jay did not say say exactly “natural born citizen”, he underlined the word “born”, which is not underlined in de Vattel. I would like to see some argument (beyond assertion) that de Vattel is the source of the phrase in Jay’s letter and why one has an underlined word and the other does not. 4. Would you assert that the Massachusetts Acts from 1776-1790 also get their usage from de Vattel? They seem to infer rather strongly that natural born citizenship is equivalent to birth location plus continuing residence (rather the same principle in the Constitution). 5. Assuming that Jay got the phrase from The Law of Nations, what evidence is there that he agreed with its ideas of who a citizen should be. Keep in mind that Jay’s ideas on citizenship could have reasonably been formed before The Law of Nations was written. Jay was surely more familiar with British common law than The Law of Nations, and could have adapted the term from “natural born subject” to his own understanding (given the differences between Swiss and British law). Since the Constitution does not precisely define even who is a citizen (it was generally understood that citizens of the United States were citizens of one of the States), can you provide any evidence that State constitutions made distinctions between types of citizen or any of them followed de Vattel in only allowing citizenship for the children of citizens (no matter if they were born in the state)? § 217. Children born in the armies of the state. In § 212, he says “natives, or natural-born citizens” suggesting the equivalence of these terms to him, so all the citizens born and described under this section are natural born citizens. (Not talking about parents). This paragraph does not create two classes of citizens, but only one, those born of citizen parents, those natural born or what de Vattel calls “natives”. I won’t to through all of these (the link’s there for you to read). The final point is that the only other citizens de Vattel envisions are those naturalized. De Vattel says: “where the single circumstance of being born in the country naturalizes the children of a foreigner.” He is defining a naturalized citizen as a citizen who is not a citizen by “natural law” (meaning citizen by inheritance). Of course, British Common Law does not call these persons naturalized but rather natural born subjects. Here de Vattel simply misstates British common law terminology. However you slice it, de Vattel envisioned only two kinds of citizens: “natural born” and naturalized. The Constitution also defines only two kinds of citizens (natural born and naturalized), and the 14th Amendment only confers two kinds of citizenship (born or naturalized). So therefore, by de Vattel or by the Constitution or by the 14th amendment, President Obama is either a natural born citizen or a naturalized citizen. If you follow de Vattel, you must say naturalized. Do you say that? 1. Do you know the Constitutional requirements for holding the office of President of the US? 2. Do you know what constitutes a Natural Born Citizen? 3. If you voted for Obama, did you know BEFORE you voted that has father was not a US Citizen? My guess as to the truthful answers to all 4 questions would be overwhelmingly NO. Not really a good arguement in my opinion. You only have 3 questions. But, the 4th question could be DO YOU CARE that Obama’s father was NOT a U.S. Citizen. I suspect the answer to that question would also be NO! for the majority of people who voted for Obama. Do you think Barack Obama, born in the United States, is constitutionally eligible to be president regardless of whether his father was an American citizen or not? I would expect a 90+% yes response. After 5 months of concerted email and web site misinformation, I would expect the number is a lot lower. Do u know anyone who didnt know his father was not american ? I’m almost certain, most pple you know were aware & made up there mind to vote for or against him on other issues. If the pple you associate with werent aware then YOU’RE moving with the wrong crowd. I think most Americans knew Barack Obama’s father was Kenyan although they may not have thought about his citizenship. Yes, Yes, Yes, and what was the 4th question again? I left a reply under my secret identity. We’ll see if it passes moderation. 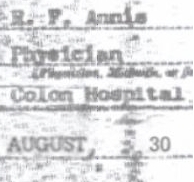 I vaguely recall that Donald Lamb, the McCain certificate’s affiant, was identified as the legal representative of the Panama Railroad Company (owner of Colon Hospital). Has this been confirmed? If the certificate is proven to be fake, is Mr Lamb subject to perjury charges or, at a minimum, to disbarment? The Urban Property Chamber of Colon, a group of business and land owners in the Atlantic side province, has filed criminal charges against Donald Lamb and several of his associates. Lamb heads a group of individuals who claim to own stock in the old Panama Railroad Company, which was taken over by the US government in the early part of the 20th century as part of the construction of the Panama Canal, and which was transferred to Panama under the 1977 Carter-Torrijos Treaties. Lamb and his followers claim that the 1904 and 1977 transfers were illegal and that they thus own vast stretches of property in the former Canal Zone. They have asserted their claims to such real estate as the ports of Cristobal and Coco Solo Norte by filing numerous lawsuits and registering claims to many properties. While in a few cases Lamb and his followers have prevailed in lower courts, such favorable judgments have been overruled on appeal. Last year, in response to Lamb’s activities, the Supreme Court ordered the Registro Civil to eliminate all deeds in the former Canal Zone that do not derive from ARI’s master deed. One provision of the controversial concession for Colon’s multi-modal transport center requires the Panamanian government to indemnify the Consorcio San Lorenzo for any legal problems that Lamb’s claims cause for the development. Now attorney Alberto Navarro has begun a legal counter-offensive on behalf of the Urban Property Chamber, accusing Lamb and his associates of falsifying documents, usurping lands, fraud, extortion and illicit association in their attempts to get money or land titles from chamber members Attia & Attia, Colon 2000, Rada SA, Nirzvi SA, Oficina Quijano, Victor Lum Lee and the Panama Canal Railway Company. Thank you,Doc. Just one more illustration why this site is the best available, despite the predilections of its gracious host.
. In recent years one Donald Lamb has come along, purporting to represent shareholders in the old Panama Railroad and on that basis claiming title to vast parts of the former Canal Zone and filing many nuisance suits that in the long run have not prospered in Panama’s courts. One major reason for Lamb’s notable lack of success is that the 1977 Torrijos-Carter Treaties had as their main subject matter the ownership of the former Canal Zone and arguably supersedes all prior laws and assertions of legal rights with respect to the real estate. But Lamb persists, and recently he’s been serving businesses in Colon with notices that the Panama Railroad’s lease of what is now the city has expired and that people there now have to start paying rent to him. Panamana law prohibits the extradition of Panamanian nationals. The internet buzz about McCain’s birth location started months before the Colon certificate surfaced. My guess is that the guy saw an opportunity to make a quick buck and took it — somewhere along the line he probably charged some some sort of “processing” fee to produce the document. If the fee was small enough it would be an easy scam (say, $200) – lawyers are used to paying investigators, court reporters, etc. for their services, so a “reasonable” charge for the birth certificate would not be a tipoff of anything being amiss. That was a very nice thing to say. I have opinions, but that’s not what the site is supposed to be about. It’s supposed to be about information and combating misinformation. In the comments and the Lounge articles, I say things from time to time that express opinions, but you’re welcome to take the facts, and flush the opinions. No, Actually I think by Vattel’s definitions, Obama would not even be considered to be a US Citizen, much less a Natural Born Citizen. This is exactly the same stance taken with Chester Arthur – who’s citizenship issues parallel Obama’s. Obama is clearly a citizen under the 14th Amendment. If we were discussing 18th Century Europe, there might be an argument. We aren’t. Great Comment. To hell with the truth or the law, it just matters what the 60 million ignorant voters thought of him. (leaving room for a few million non-ignorant ones). I see how you think. That’s ONE mans honest answers. Even your cohort in here stated most people would’ve said NO. And I too wonder what that 4th question was? I suspect that most everyone knew that Obama’s father was born in Kenya–it was all over the news. But, because Obama was born in Hawaii and his mother was a U.S. citizen, no one cares that his father was born in Kenya because Born in USA = NBC. Got it? Sally, I would point you to this section from The Law of Nations. It describes someone born in England who is “naturalized” by the fact of his birth there. Could you explain why you think this doesn’t apply and why Obama wouldn’t be considered by de Vattel a “naturalized” citizen under British Common Law? …Finally, there are states, as, for instance, England, where the single circumstance of being born in the country naturalizes the children of a foreigner. The “NO” was copied from the original questioner, not the comments on it. changed, the requirements for conferring and retaining derivative citizenship have also changed. Alas, Cugino Mario, better and more experienced legal minds than yours appear to have formally settled on a different definition of “natural born citizen.” Since jus sanguinis is found nowhere in the Constitution, and since “Natural born citizen” is in Article II, it can have nothing to do with the citizenship of the parents. As to part one, MY Bad, I read your first post to fast, overlooking you made a quote. As for your end comment, That is YOUR Opinion as to the NBC. It is NOT clear and has NOT been made legally clear from the courts EXACTLY what = NBC. Only because the Supreme Court was to scared to actually HEAR a case, for fear it would find in favor of the plaintiff and cause a war, it has NOT been decided no matter how much you wish to believe it has, it has not. Keep enjoying your dreams while the country goes down hill. In 6 weeks Obama has proven to be the Worst President EVER. His Marxist ways will ruin this country beyond any immediate repair, at least in this lifetime. Some Great Historic Event he has caused. I think it reasonable not to expect the economy to respond to anything Obama does for 6 months to a year. What you’re seeing is the result of what failed to fix it before Obama became president. Or: SCOTUS recognized they lacked jurisdiction to hear those cases because those litigants lacked standing. 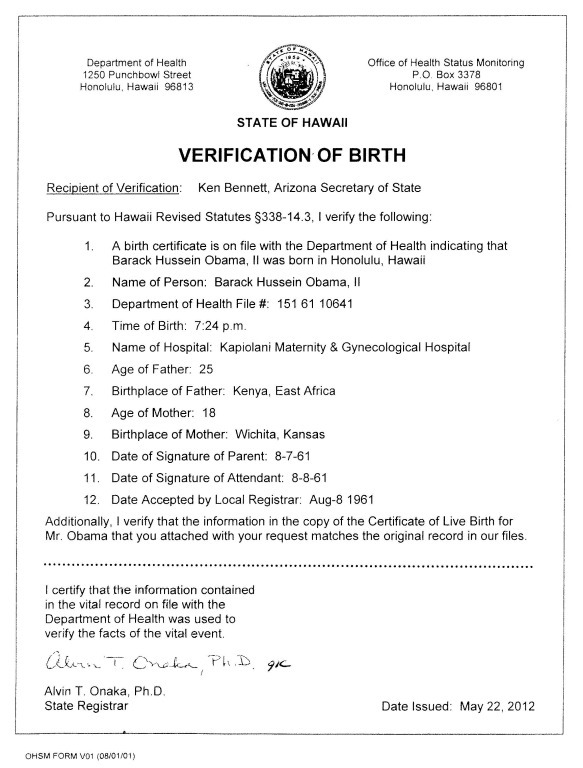 I have a dozen web pages here that say that it is totally clear that Obama, born in Hawaii, is a natural born citizen. 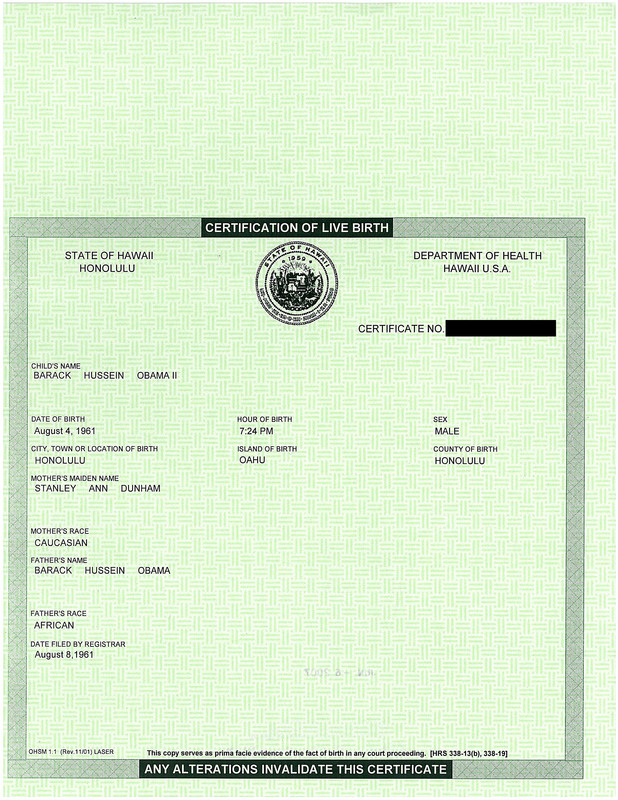 What I don’t understand, and maybe I’m just blind, but why do these birthers continue to post the image of the birth cert that had the number blacked out and you couldn’t see the seal? The images on Fact Check are clearer and completely show the seal, the signature, the certification number, etc. Is it because those images would destroy their claim of a forgery? They never display anything that hurts their cause. The same for me, I always use the FactCheck images for the same reason. Uhh, well, actually I use both because I’m interested in the truth. I can’t decide which is more useless — the proposed amendment or Mr Wiegel’s comment on it. “Other certifications, such as a certificate of live birth, shall not be accepted. ” is pretty stupid language since just about every birth certificate issued in the country is called a “certificate of live birth”. If this amendment were passed, I don’t guess they will have anyone on the ballot. Hawaiian vault copies all say “Certificate of Live Birth” on them. SPoken like a good Democrat, blame Bush. It will be 2012 and we will still hear how it is G.W.’s fault. Meanwhile Obama will have converted this country into the socialist place he intends to by bankrupting it. To FIX the debt we have to Quadruple the Debt…Thats some kind of math. A dozen pages that “say” it is clear. HAHA. That’s like Obama SAYS he will fix everything, it must be True. It’s no less true than pretending that capitalizing the word truth makes it so. And what’s wrong with some good socialist policies such as access to education and healthcare? Whats wrong with socialist ideas? Absolutely nothing where they work. Would you like a list of the countries you can move to and enjoy a happy socialist lifestyle? United States is a capitalist country with freedoms that allow for unlimited growth based off your desire to succeed. Yes there are economic concerns here, but bankrupting the U.S. and having full government control is not the answer. There are tickets for sale to Europe at Delta.com now you should look into. We have a hybrid economy. I’m thinking of such things such as government mandated Unemployment Insurance right now, and FDIC insurance of bank deposits. I just love how liberals will try anything to jusify their twisted thinking. They cannot be shamed. We are shamed for not working harder to spread the truth. Every person born within the United States its territories or districts whether the parents are citizens or aliens is a natural born citizen. Obama’s father was “residing” in US when he was born, he was under the jurisdiction and protection of US. Even children of aliens are natural born citizens. I think you should review Constitution topic: Citizenship read about the categories of people considered natural born, everybody falling in these categories qualifies for president or vicepresident of the US. @Sally Hill: what does Mattel have to do with this? We’re talking about Obama, not Barbie.